SuperDerm Solution® is also great for dogs! The electrostatic properties of this uniquely formulated product attract debris and microorganisms away from the skin like a magnet. The elimination of these stress factors allows the normal and healthy function of skin to be restored. Processed extracts of coconut, corn, soybean, and tree sap formulated with amino acids, fatty acids, alkanolamines, and nonionic surfactants. Wash animal at least once a week and more if necessary. Thoroughly wet the affected area with water. Spray SUPERDERM SOLUTION generously on the area. Gently massage into the skin and allow to stand for five minutes before rinsing well with water. Repeat daily until improvement is observed. APPLICATION TO DRY COAT: Spray dry coat of affected area generously with SUPERDERM SOLUTION until very wet. Let stand and dry. Repeat one to three times daily until improvement is observed. WOUND CLEAN-UP: Clean and rinse area thoroughly with water. 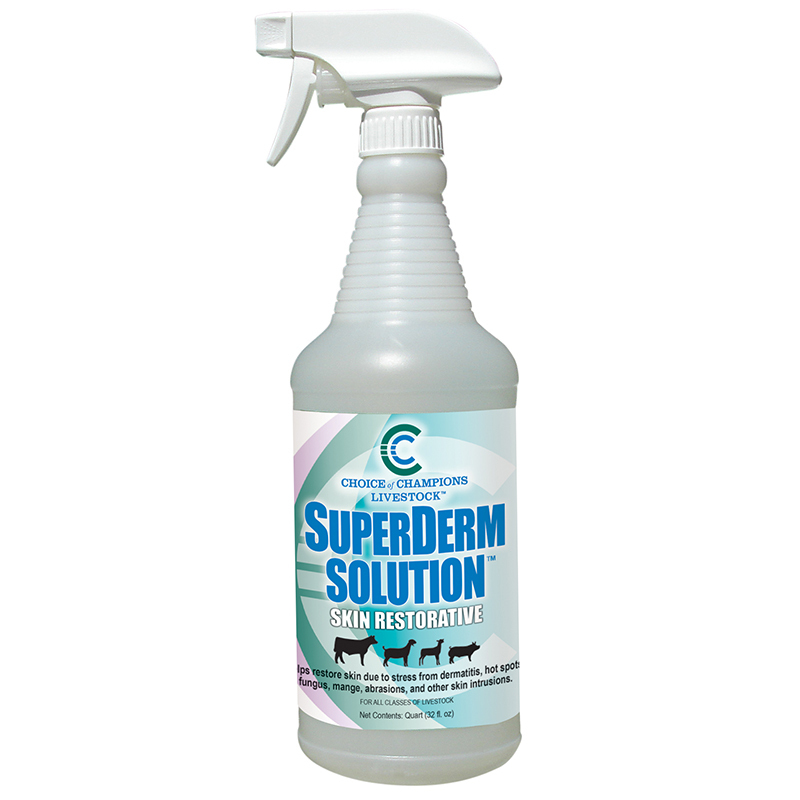 Gently apply SUPERDERM SOLUTION with a sponge or cloth. Let stand and dry. Repeat on a daily basis. CHOICE OF CHAMPIONS products should be stored at 40-80 degrees Fahrenheit. Extreme hot and cold temperatures and direct sunlight may cause ingredient breakdown. When properly stored, Choice of Champions products have a shelf life of two years.